This is another book which is a puzzle - roach fishing is tremendously popular and this is an absolute classic and yet there aren’t any good quality reprints of it around. The problem is almost certainly that it is a small octavo and only 114 pages long, which means that the format ‘doesn’t fit’ and so it stands no chance of appearing in a new quality edition, which is a shame, because it was the roach-fisher’s Bible for decades and was written by the nineteenth century expert on the subject, the much respected Greville Fennell, a frequent contributer to The Field and a man who was often resorted to as the final arbiter on many technical questions of the day. 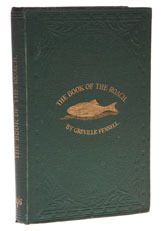 Every roach fisherman should at least have read this, the snag being that copies in good condition are fairly expensive. The modern equivalent is Mark Everard's The Complete Book of the Roach.